By making playlists in centovacast you can create shows , commercial stop sets, promos, music breaks, and much more. The playlists are also programable by days, and time or even in set intervals. 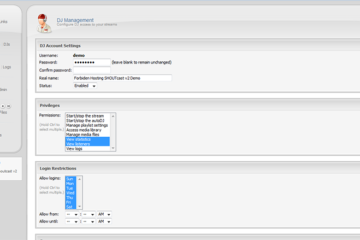 The playlist manager allows you to create and configure playlists to control how and when your media is played. You can create as many playlists as you like, each with its own distinct settings, and Centova Cast will automatically determine when to play each one based on your settings. To create a new playlist, click the Create Playlist link in the upper, right-hand corner of the page. This will launch the playlist editor, described under Playlist Editor below. To edit an existing playlist, click the Edit Playlist icon next to the playlist you wish to edit. This will launch the playlist editor, described under Playlist Editor below. To delete an existing playlist, click the Delete Playlist icon next to the playlist you wish to delete. This will permanently remove the playlist, its settings, and its list of tracks. To enable or disable an existing playlist, click the Enable Playlist icon next to the playlist you wish to delete. A disabled playlist will be ignored by Centova Cast. The playlist editor allow you to configure a playlist. Specifies the title for the playlist. This is used only to help you identify the playlist, and is completely ignored by Centova Cast. Use a descriptive name like “Heavy rotation” or “Friday night’s top 10 countdown” to ensure that you’ll remember what this playlist is for. Specifies the status of the playlist. If the playlist is Enabled, it will be included in your stream; if it is Disabled, it will be ignored by Centova Cast and its tracks will never be played. General rotation playlists are used to play media from your library when no scheduled, interval, or immediate playlists are due to be played. This is the “default” playlist type, and most stations spend the majority of their air time playing random tracks from general rotation playlists. Scheduled playlists allow you to schedule a list of tracks to be played at a specific date and time. These playlists can also be setup to repeat on a schedule, making them ideal for daily/weekly countdowns or pre-recorded shows. Interval playlists allow you to play tracks at regular intervals of several minutes or several songs. These playlists are useful for playing frequently-recurring content, such as station identification or commercial advertisements. Immediate playlists allow you to queue tracks to be played immediately after the end of the current track. These playlists are useful for playing tracks on demand, such as song requests. For more information about how tracks are selected when multiple playlists of different types are activated, please see the section entitled Track Selection below. 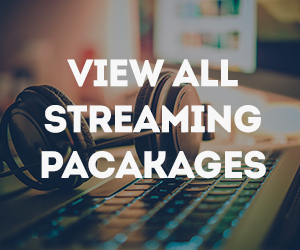 Specifies the track playback order for General Rotation, Scheduled, and Immediate playlists. If set to Random (shuffled), tracks will be selected at random from the playlist. If set to Sequential (in order), tracks will be selected in order from the playlist, starting with the first track, and restarting when the end of the playlist is reached. The playlist editor also includes a number of additional fields depending on the playlist type. Those are discussed in the sections following immediately below. In this example, for every 10 tracks that are played, on average, 6 will be selected from the Power rotation playlist, 3 will be selected from the Heavy rotation playlist, and 1 will be selected from the Light rotation playlist. As such, you might place your most popular tracks (new releases, for example) in your Power rotation playlist, to ensure that they are played most frequently. You might place older favorites in the Heavy rotation playlist to ensure that they are still played often, though less often than the new releases. And you might place your less popular tracks in the Light rotation playlist to ensure that they are played only occasionally. General rotation playlists can also be limited to a specific period of the day. This can be used to play lighter songs in the morning and heavier songs in the afternoon, for example. If no time period is selected, the playlist will be active for the entire day.Note that setting a time period for a general rotation playlist is different than creating an actual Scheduled Playlist. Scheduled playlists are exclusive to their time periods, and no general rotation tracks will play during a scheduled playlist. In contrast, if a general rotation playlist has a time frame configured, and there are other general rotation playlists configured for the same period (or with no time restriction at all), Centova Cast will select tracks from each of the playlists according to their weighting as described above. Also note that at least one general rotation playlist must always exist without any time restrictions. This playlist is used as a failsafe in case Centova Cast ever encounters a scenario in which it needs to select a track, but no other active playlists are scheduled. In the event that all active general rotation playlists are configured with a time restriction, Centova Cast will ignore the time restrictions on all of the general rotation playlists and treat them all as if they were active for the entire day. For more information about how tracks are selected when multiple playlists are activated, please see the section entitled Track Selection below. Specifies the date on which this playlist should be activated. The playlist will remain inactive until this date. You may optionally click the “…” button to choose the date visually on a calendar. Specifies the time at which this playlist should be activated, on the date specified in the Scheduled date field. The playlist will remain inactive until the scheduled date at the scheduled time.Important scheduling note: All dates and times will be in the time zone configured on the “Stream” tab of the Configuration Settings page. If selected, the playlist will play only at the scheduled date/time. After it has played, it will effectively be disabled. If selected, the playlist will play every day at the scheduled time, starting on the scheduled date. If selected, the playlist will play every week on the selected weekdays, at the scheduled time, starting on the scheduled date (or rather, on the first selected weekday after the scheduled date). The weekdays on which the playlist should be activated can be selected using the Repeat on field, which appears only when the Weekly repeat schedule is selected. If selected, the playlist will play every month, on the scheduled day of the month, at the scheduled time. You can alternately use the Repeat on field, which only appears when theMonthly repeat schedule is selected, to have the playlist played on the first or last day of the month instead of on the scheduled day of the month. If selected, the playlist will play every year, on the scheduled day and month, at the scheduled time. When selected, Centova Cast will play all tracks from the playlist, in order, at the scheduled time. When selected, Centova Cast will play all tracks from the playlist, in random order, at the scheduled time. 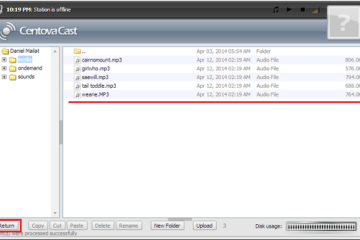 When selected, Centova Cast will randomly play a single track from the playlist at the scheduled time. If selected, the playlist will always play through to completion before any other scheduled playlists are permitted to play. If any other scheduled playlists have been scheduled to start while this playlist is still playing, they will be delayed until this playlist finishes. If selected, this playlist will be aborted if another scheduled playlist is due to start while this playlist is still playing. Note that for technical (and aesthetic) reasons, Centova Cast cannot interrupt individual tracks while they are still playing, so the new playlist will be started at the next available opportunity (i.e., when the current track finishes). Specifies the maximum number of minutes for which this playlist should remain active once started.Note that this setting is subject to the standard playlist rules enforced by Centova Cast; specifically, Centova Cast will never interrupt a playing track. For example, if your limit is set to 5 minutes, and an 8 minute track is started, the track will play through to completion even though it will exceed your limit by 3 minutes. Also note that this limit is relative to the time at which the playlist actually started, not the time at which it was scheduled. Take the following scenario for example: say you scheduled your playlist for 3:00 and configured it to stop after 20 minutes, but it started 5 minutes late because of a late-playing track in an earlier playlist. In this case, the timer will be started at 3:05 (instead of 3:00), and thus the playlist won’t be stopped until 3:25 instead of 3:20. Specifies how often the playlist should repeat. You may specify that the playlist should repeat either after every few songs, or after every few minutes. You may also specify an interval (in songs or minutes) at which the playlist should repeat. Specifies how tracks are selected from the playlist. If Play only one randomly selected track from this playlist is selected, Centova Cast will choose a single track from the playlist, then consider it “inactive” until the next interval. If Play all tracks from this playlist in order is selected, then Centova Cast will play the all tracks from the playlist, in order, at each interval.For more information about how tracks are selected when multiple playlists are activated, please see the section entitled Track Selection below. When creating playlists, it is important to understand how Centova Cast will select tracks when multiple playlists are activated. At the end of each song, Centova Cast performs a number of checks, in a specific order, to determine which playlist to select a track from next. Note that Centova Cast will never interrupt a track to change playlists. That is, if a playlist is scheduled to start at 10:30, and a 10 minute track starts at 10:25, the scheduled playlist will be deferred until 10:35 to allow the track to finish. This is a common cause for concern for stations which play “mix tracks” which may be an hour or more in length. If an Immediate playlist is enabled, it will always take precedence over all other playlist types, and it will be played through to completion before any other playlists will be consulted, even if this requires interrupting another playlist. Upon completion, the status of the Immediate playlist will be set to disabled to ensure that it is not repeated. If it is time to play a Scheduled playlist, it will always take precedence over all other playlist types (except Immediate playlists). Once a Scheduled playlist starts, it will be played through to completion, or to its scheduled stop time, before any other playlists are consulted.If two Scheduled playlists conflict (i.e., if one is scheduled to start while another is still playing), Centova Cast will consult the active playlist’s “Interruptible” flag. If the active playlist is configured to be interruptible, Centova Cast will immediately abort the active playlist (leaving the remaining tracks unplayed) and begin the second playlist. If the active playlist is not configured to be interruptible, the second playlist will be deferred until the active playlist finishes. If it is time to play an Interval playlist, it will always take precedence over General Rotation and Song Request playlists. If song requests are pending and due to be queued (based on the stream’s request settings), they will always take precedence over General Rotation playlists. If no other playlists are due for playback, a track will be selected from one of the General Rotationplaylists. Selection of tracks from General Rotation playlists is “weighted” as described under General Rotation Playlist Options above, to ensure that tracks from “heavier” playlists are chosen more often than those from “lighter” playlists.If a General Rotation playlist has been configured for only a specific time period, it will only be included in the rotation during that time period. During that period, it will be treated just like any other General Rotation playlist, and included in the rotation based on its weight. Outside of the configured time period, the playlist will be treated as if it is disabled.